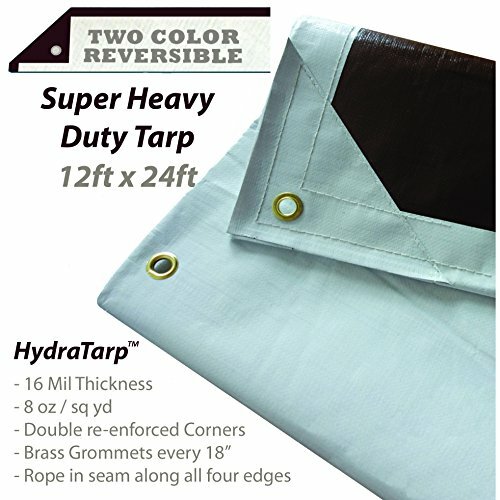 The HydraTarp family of Super Heavy Duty Tarps are designed for general purpose use and are manufactured with industrial grade materials and built to last. By using high grade material with 16mil thickness and a 14 x 14 weave, double re-enforcing all corners, heat sealing a thick rope along the hem of all outer edges, and using the highest quality brass grommets, Watershed Innovations delivers a high quality products at a fair price. Double re-enforced corners with rope hem along all four edges. Brass Grommets spaced every 18"
UV Protective coating protects your valuable assets and ensures longer life of the tarp. These are full length tarps and measure within +/- a few inches of the full listed size. If you have any questions about this product by Watershed Innovations, contact us by completing and submitting the form below. If you are looking for a specif part number, please include it with your message.